involvement and increased student achievement. Even after all factors such as social class, socio-economic status, ethnicity, family structure and parents’ educational attainment have been factored out, parental involvement still remains a significant predictor of student achievement and adjustment. experience may have been negative and this can impact on how they engage with and participate in their child’s schooling. both school and community goals. 1. Help parents understand why they are so important to their children’s school success. 3. Take time to assess current practices in your school before embarking on a program for parental involvement. Assess what is working well for the school as a whole and what is working well for particular grades. Determine what to continue and what new initiatives to try. 4. Develop a long term plan that includes evaluation of your success. 5. Look at parental involvement as having results for students, for parents and for teachers. 6. Epstein suggests six types of involvement: parenting, communicating, volunteering, learning at home, decision making, and collaboration with the community. 7. Each school year, provide parents with the opportunity to learn how to support, encourage and help their student at home. 8. Communicate to parents what their student will be learning in each subject. 9. Be respectful of family time and the diversity of families. 10. Encourage parents to provide input on policies that affect the education of their children. 11. Development of an effective partnership with parents is an incremental process not an event. for increasing parent knowledge of curriculum and supporting their student at home. ◾Listen. Encourage your child to talk about school, social events, other kids in class, the walk or ride to and from school so you can identify any issues he or she may be having. ◾Look. Watch for symptoms that your child may be a bullying victim. Be aware of signs such as withdrawal, a drop in grades, physical signs, or needing extra money or supplies. ◾Establish a Routine. Setting a regular time and sticking to it helps children complete their homework assignments. ◾Set the Mood. Ensure the room your child studies in is quiet, has plenty of light, and has school supplies close at hand. Remove distractions by turning off the television and discouraging social phone calls during homework time. ◾Show an Interest. Ask your child about school activities and talk about what was discussed in school that day. Take your child to the library to check out materials for homework, and make time to read with your child as often as you can. ◾Be Informed. Find out about the school's policy on homework at the beginning of the school year. Ask your child's teachers about the kind of assignments that will be given and what kind of time frame the children have to complete them. questions, look over completed assignments, and encourage your child to share returned assignments so you can read the teacher's comments. support how he or she learns best. ◾Encourage Good Study Habits. Help your child get organized. Ensure your child has scheduled enough time to complete assignments. ◾Talk. Discuss homework with your child. Talking about an assignment can help your child think it through and break it down into small, workable parts. ◾Provide Encouragement. Find ways to support your child's efforts in completing assignments. ◾Make Reading a Priority. Let your child know how important it is to read regularly. Establish a regular time and place for reading. ◾Read to Your Child. Make time to read to your child on a regular basis. It is a great way to help develop a love of learning. ◾Ask Your Child to Read to You. 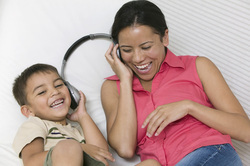 Have your child read aloud to you. ◾Keep Reading Material Close By. Make sure children's books and magazines are easily accessible. Keep a basket of books in the family room, kitchen, or your child's bedroom to encourage him or her to read more often. * Celebration of learning portfolios, and similar classroom events. * Send home a “Grade __ at a glance” note home at the beginning of the year for parental informational purposes. * Parents NEED to be involved in behaviour plans, if at all possible and conducive, in the planning, designing and executing stages. They know their child best after all! * Providing workshops, guiding parents in specific helpful activities to do to be involved in their child's learning. For example, math and reading games and strategies. * Have a class website, family bulletin board or journal, to which all can contribute to as desired. * Invite the parents into the classroom to speak to the class about their jobs or hobbies. * Give plenty of volunteer opportunities. * Have fun days, during which you invite parents to come too!